The new European Rugby Champions Cup will benefit fans without damaging the international game, says Premiership Rugby chief executive Mark McCafferty. The new tournament, which replaces the Heineken Cup, will start next season after it was approved on Thursday. It ends a two-year dispute over the structure of European club competition. "Unrest over the future of the Heineken Cup began in June 2012, when the English and French clubs announced they would quit, unhappy with qualification, revenue distribution and governance. 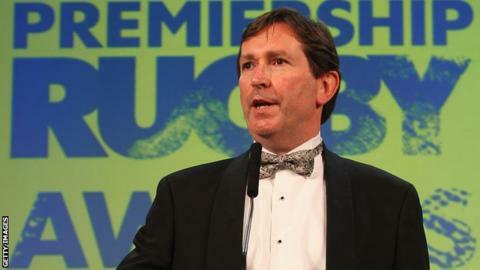 "Soon after, Premiership Rugby signed a TV deal with BT, while ERC extended its deal with Sky. "In October 2013, the English and French clubs announced they were setting up the Rugby Champions Cup, which had the support of the Welsh regions. When the French clubs pulled out, an Anglo-Welsh league was at one stage a distinct possibility. "For much of the last year prospects looked bleak, but this new agreement secures European club competition for at least eight years." "I would argue this does not need to be to the detriment of the international game if you do it in the right way," McCafferty told BBC Radio 5 live. The Champions Cup will involve 20 teams - a reduction from 24 - with six from the English Premiership, six from the French Top 14 and seven from the Pro12. The 20th qualifier will be decided by a play-off. A new European Rugby Challenge Cup will replace the second-tier Amlin Cup, while a third-tier cup will be introduced, called the Qualifying Competition. Rugby's authorities have been working together to attempt to resolve a dispute sparked in June 2012, when the Premiership and Top 14 clubs gave two years' notice they would be withdrawing from the Heineken Cup. The clubs were unhappy with the distribution of money from the tournament, and with its qualification structure. Thursday's eight-year agreement for the new set-up was signed by the unions for each of the Six Nations countries, along with the club bodies for England, France and Wales.